In America Jade was billed as a cross between Jerry Lee Lewis, Little Richard, and Liberace. Jerry Lee, because of his energetic piano antics like jumping all over his piano and kicking the keys with his feet (like Jerry Lee used to do but this Aussie rocker still does) ... Little Richard because just like Richard, (Jade Hurley always makes a great and controversial headline) ... and Liberace, because of his flamboyant and glittery sequin stage outfits combined with $250,000 worth of diamond, sapphire, and ruby jewellery … and the energy with every show many critics describe as “breathtaking” and wonder how he does it performing so many shows. 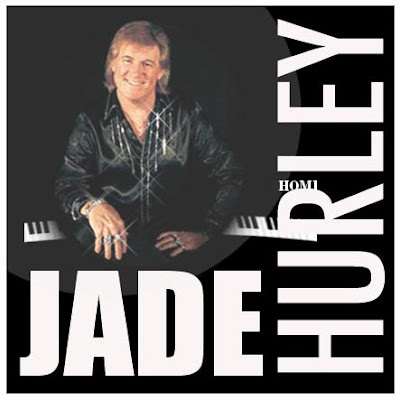 One respected American journalist wrote ... QUOTE “Every time you see this Aussie Jade Hurley rocking away and jumping all over his piano, you get the same high class performance ... I just don’t know how he does it or where he gets the energy from” ... end quote. It has long been acknowledged by many that this “Aussie King of Country Rock” is the "ULTIMATE SHOWMAN", and it has also been stated by some of the greatest critics in the world of show biz that JADE HURLEY is quote ... “The hardest act for anyone to follow on stage”. He was awarded the highly prestigious ORDER OF AUSTRALIA MEDAL (OAM) for his contribution and hard work within the entertainment industry encouraging and nurturing young talent, and for his tireless performances and appearances over many years in aid of charitable organisations including The Arthritis Foundation ... The Heart Foundation . . . Camp Quality (kids with cancer) ... The Australian Cancer Foundation for Medical Research. In the "Flashback" segment from an episode of the 1970's Daryl Somers remake of "Bandstand", here's "Whole Lotta Shakin". The Film Clip (Music Video) of Jade Hurley's Don't Ask Me To Stay.